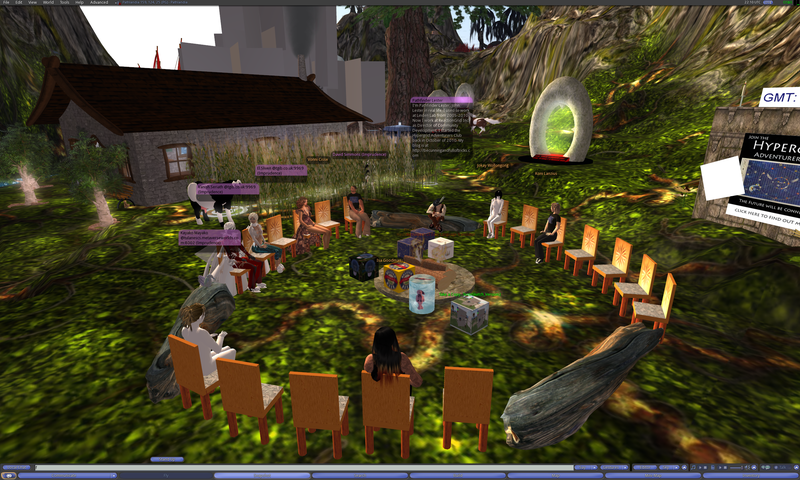 The focus of the Hypergrid Adventurers Club is learning and sharing knowledge. We’re pioneers who explore the frontier of the evolving Metaverse. But I think it’s important to remember that a critical part of being a pioneer on any frontier is helping other pioneers. That’s how frontiers grow. Through collaboration and sharing. I recently stumbled upon a region in a grid called StaminaGrid. It was completely empty with not a single prim in sight. And I couldn’t find any contact info for the owner of the grid. Their website entry on Hyperica took me to a fitness club website with no information at all about virtual worlds or Opensim. It’s common to find projects under construction on the Hypergrid. People are constantly creating new things, and the number of new Opensim regions and grids continues to grow at a rapid pace. So you expect to occasionally find a totally empty region like this. But this region had building/rezzing enabled, with autoreturn turned off. Which meant I could rez or build anything I wanted, and it would remain on the region until the owner manually removed it. Had the region changed owners and was now lost in the shuffle? Was it running on a forgotten server somewhere in a dusty server room? Was the owner putting their Opensim project on hold as they worked on some new ideas? Someone told me the region used to have content and many freebies on it. But it was now empty. Our group visited this empty region and we left gifts. We left freebies and copyable items that the owner of the grid will hopefully find useful. We left a sign letting the owner know we had visited. And we left a kiosk pointing to our HGAC homepage in case the owner wants to contact us. Then we walked away with the hope that, someday, the owner will find what we left for them. Our free gifts to help them build anew. And, perhaps most importantly, we left a message of collaboration and sharing. As pioneers on the frontier of the Hypergrid, we’re all in this together. 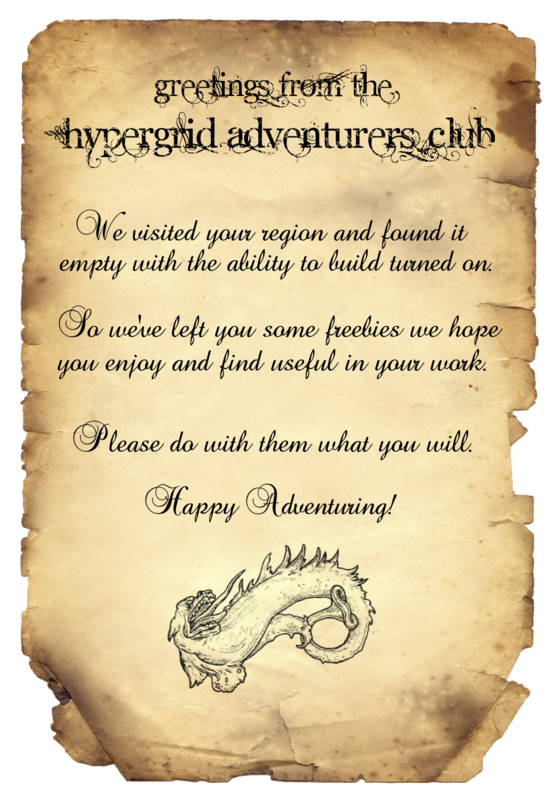 For more information about the Hypergrid Adventurers Club and how you can attend our meetings, please see our homepage. You can follow our club’s tweets at #HGAC, and feel free to join our ongoing conversations on the HGAC Google Group Mailing List. The region Pathlandia on jokaydiaGRID was having some issues. So we began our meeting at our backup meeting point, the region Scooter on jokaydiaGRID. Vanish Seriath: Good evening everyone. Vanish Seriath: Yes, I saw. Vanish Seriath: Dunno if everyone got your tweet, though. Aloe Cortex: hey, mel..you haven’t melted yet? Vanish Seriath: There was nani and Ange at the hg point. Mimi Muircastle: it’s still winter lots of places! Pathfinder Lester: Oro, so you were on Pathlandia earlier today? El Sliven: I am El Sliven/Firecaster, partner of Vanish and occasional poster on TGIB. 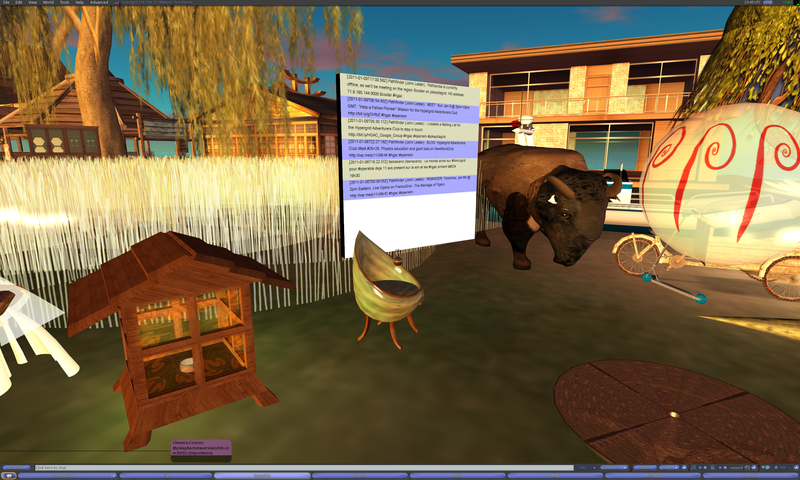 Mimetic Core: Jason Shipley in RL – virtual world developer/builder. interested in immersive learning and machinima. Vanish Seriath: Hi, I’m V of tgib.co.uk. We’re in the middle of moving stuff to a new server. Pathfinder Lester: how’s the move going, V? I saw you mentioned it on your blog. Coyote Longfall: I’m Coyote Longfall, R&D Director for Four Bridges Project, and education, non-profit, and activist organization based in Second Life. 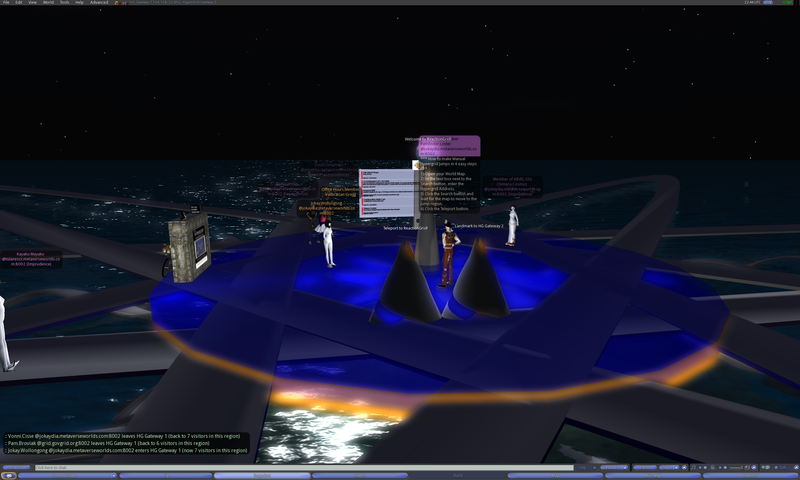 We’re expanding to other grids, currently we are also on OSGrid and SpotOn3D, and have a group presence in Inworldz. 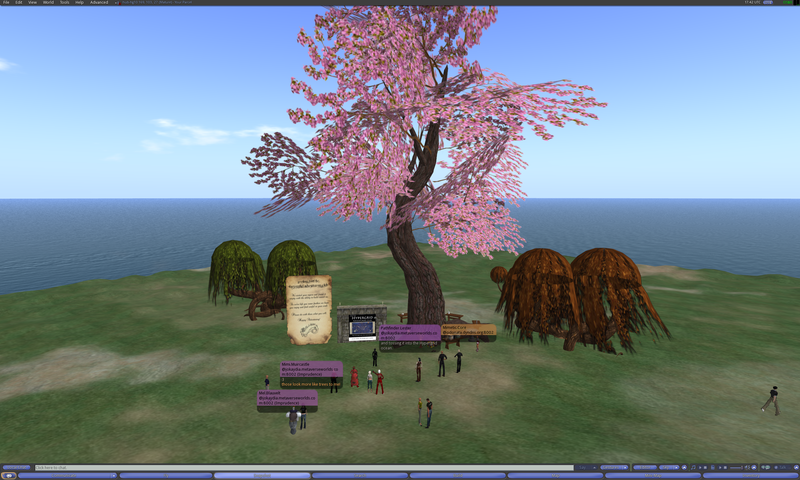 We offer community based support to educational institutions, NGOs, and other groups in virtual worlds. Vanish Seriath: Well, it works well so far. Setting up a mailserver must be the most insane task ever. 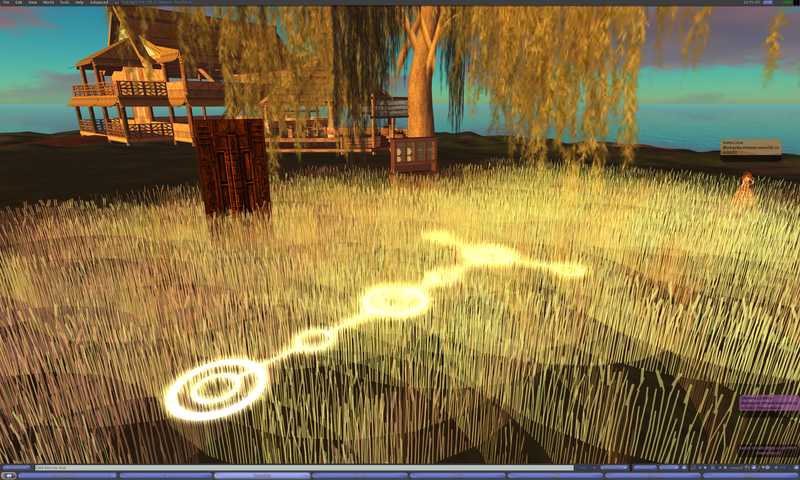 Vanish Seriath: Makes installing opensim look like a stroll in the park. Ange Menges: Hi I ‘am Ange and I came today to apologize to the HGAC for the thursday operabis evening. Pathfinder Lester: fabrice, that’s ok. I hope the opera went well even though we had trouble joining it. Pathfinder Lester: what was the problem? 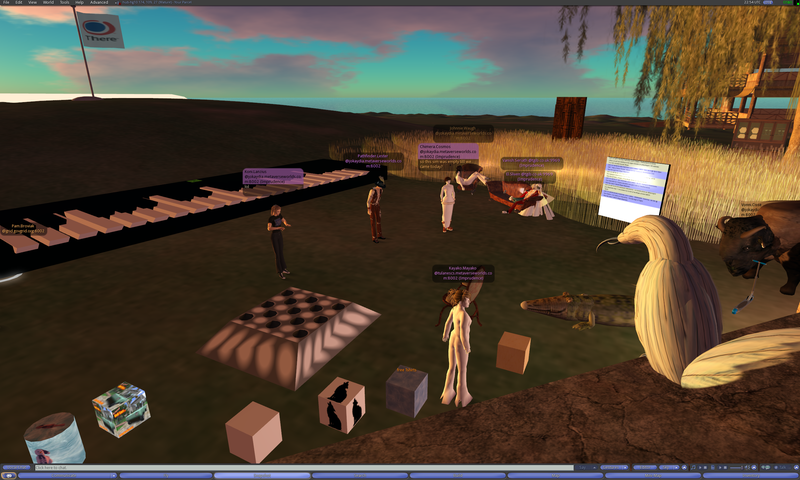 the first opera seemed to work fine for hypergrid visitors. Marmottina Taurog: Hi everyone ! Pathfinder Lester: well, i am reminded of a saying by Confucius. Vanish Seriath: Hopefully one more time than you fall. Pathfinder Lester: TV! that’s fantastic! Pathfinder Lester: do you have a link to the TV video? Pathfinder Lester: i did not see it. Pathfinder Lester: oh great. i can’t wait. 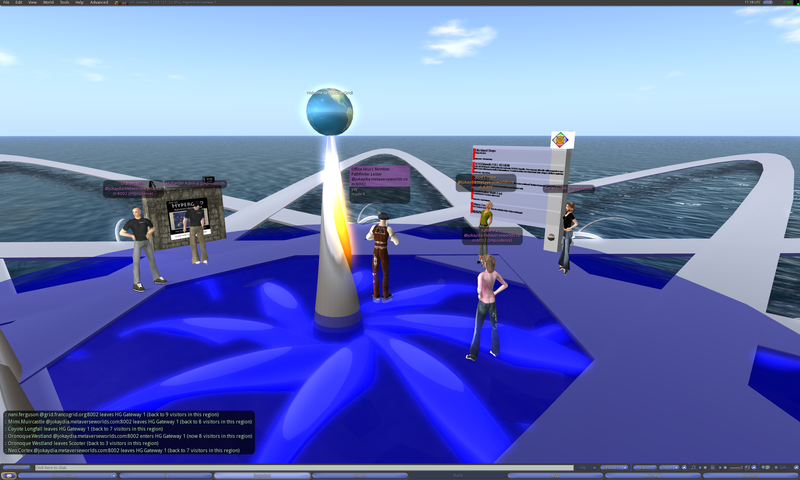 Pathfinder Lester: and a good way for new members to talk to all of us before they join their first meeting inworld. we can help them get started. Pathfinder Lester: it’s still a pretty active list. and the archives are a great resource, too. Pathfinder Lester: and i found a totally empty region. with building/rezzing enabled, and no autoreturn. Pathfinder Lester: i could not find any contact info for anyone at Stamina Grid. no website, either. Mimi Muircastle: so no one owns it? will they be happy about our building? Mimi Muircastle: we could hire ourselves out as settlers! Aloe Cortex: they had a great freebie center… it is all gone? Pathfinder Lester: Mimi, I don’t know. All i know is that it is empty and allows building. I thought it would be a good gesture for us to leave freebies. Ange Menges: And what about your tests on HG 1.5 with Neo, Pathfinder ? Pathfinder Lester: Aloe, i did not see it. the sim is currently empty. Pathfinder Lester: Kattan, it’s easy enough for them to return anything we leave. and if we leave freebies, perhaps they can use them when they rebuild. Vanish Seriath: Aw, regarding HG 1.5: I’m currently experimenting with running both 1.0 and 1.5 on the same server. Pathfinder Lester: i made a sign that I’m going to leave on their region. so they know we’re not “invading” and that we have good motives. i will rez it here now to show you. Here’s a full resolution copy of the image if you’d like to use it in your own travels. Mimi Muircastle: we come in peace…. Vanish Seriath: It works good so far. Our standalone is accessible from both versions. Aloe Cortex: what a great idea! Pathfinder Lester: oh Vanish, that’s great! so it’s working well so far? Coyote Longfall: Vanish I was wondering about that – is there anyway to have both sims running at the same time? Vanish Seriath: Well, yes. It just uses two separate databases. Mimi Muircastle: I like that greeting! Coyote Longfall: can you cross over? Vanish Seriath: No, that’s the problem. Vanish Seriath: users aren’t persistent between the two. There’s an entry for this grid on Hyperica (http://www.hyperica.com/2010/06/stamina-grid/). But upon visiting it, you can see that the region is completely empty. The ability to build and rez objects is enabled. Perhaps they are planning to build anew and are looking for some new content? Let’s give them a hand! Rez whatever useful freebies you have and leave them on the region. This will be a special “Help a Fellow Pioneer” mission for our club. 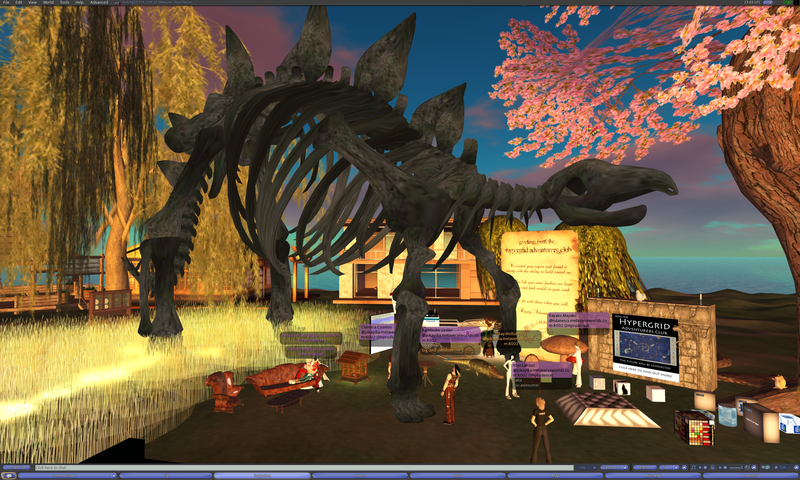 *** jokaydiaGRID has a Newbie Dome for folks to pick up freebies that can help them get started. 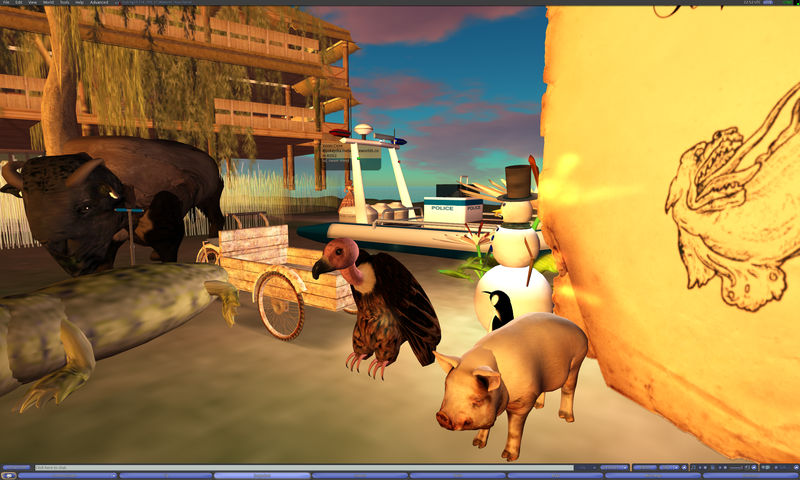 If you find any good freebies in your Hypergrid travels that you’d like to share, you can put them in the Newbie Dome. There’s currently a lack of many good outfits and items for male avatars, so it would be great if we could find more items like that to share. Mimi Muircastle: 🙂 me too, Oro – for a long time! Vanish Seriath: Yes, true Mimetic. Vanish Seriath: You *can* use the same db for both versions, but not at the same time. Vanish Seriath: So to keep both instances running I had to make two separate databases. Pathfinder Lester: Neo, glad you could make it! Vanish Seriath: In soviet russia, linux struggles with you. Pathfinder Lester: neo, yes, i know. there are holes that people fall thru when tping to different regions on jokaydiagrid. sometimes they wind up on reactiongrid. Pathfinder Lester: i’ll keep investigating from my end and see what’s up. Pathfinder Lester: at least its a reproducible bug! We all make a manual jump from the region Scooter on jokaydiaGRID, and arrive on the region HG Gateway 1 on ReactionGrid. Pathfinder Lester: on to Stamina Grid! We all make a manual hypergrid jump from the region HG Gateway 1 on ReactionGrid, and arrive on the region hub-hg10 on StaminaGrid. fabrice parisi: nani tu passe pas non plus ? Mimetic Core: now i recognize this grid. someone originating from this IP address kept visiting my grid – maybe 20-25 times in 1 week. when i checked the IP i got that fitness site. weird. Pathfinder Lester: and i searched on Google for a website for this grid, but could not find anything. Pathfinder Lester: this place might be forgotten. Pathfinder Lester: and tossing it into the Hypergrid ocean. Mimi Muircastle: those look more like trees to me! Pathfinder Lester: oh good, we are leaving them some good free beer. Mimi Muircastle: we should be a little classier than that! Mimi Muircastle: again, sure hope they feel the same way! Pathfinder Lester: Mimi, i am hopeful they will be pleasantly surprised. Mimi Muircastle: of course – just joking:) I like this idea! Pathfinder Lester: Neo, ha! that’s excellent. Mimi Muircastle: hey I am in the middle of a field of something! Vanish Seriath: That’s okay. I had a nutcracker in the inn. Pathfinder Lester: Neo, me too. 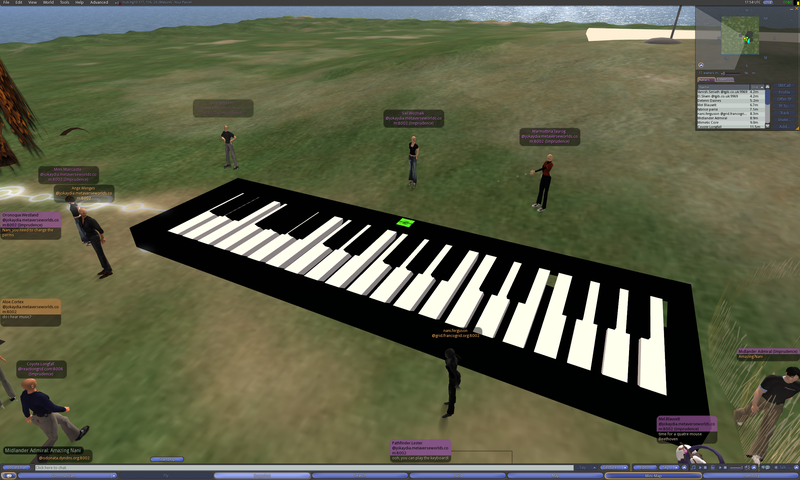 that will be a big help for content creators on Opensim. Pathfinder Lester: i’ll continue to keep my eye out for regions that seem to be unused and have rezzing/building enabled with no autoreturn. Pathfinder Lester: i like the idea that we can explore and not just *take* things we find. but also *leave* things to help other people. Vanish Seriath: Heh. home is where my inventory is. Graham Mills: lol @El & Vanish — you comfy there, guys? Mimetic Core: nice crop circle neo! Vanish Seriath: I didn’t get to create much lately, but I’m looking forward to make new things. Pathfinder Lester: Neo, oh cool. ty for doing that. Vanish Seriath: Aw, thanks Midlander. Vanish Seriath: You’re most welcome, Aloe. Vanish Seriath: That’s what I’m doing it for. Mimi Muircastle: me too – I moved to JK to give myself a place to learn to build with lots of prims! Aloe Cortex: do any of you know about other sources like vanish’s and openVDE to get things for sticksims? Aloe Cortex: so he is!! Aloe Cortex: there are a few things there, graham. thanks! Pathfinder Lester: ooh, you can play the keyboard! Aloe Cortex: do i hear music? Marmottina Taurog: Love this piano ! That’s the end of our first visit of the day to StaminaGrid. Read on for our second visit later that afternoon. Kayako Mayako: Hi John, Are you on voice or text? Pathfinder Lester: Kayako, you appear to be coming from a grid I’ve never visited before. Tulane? 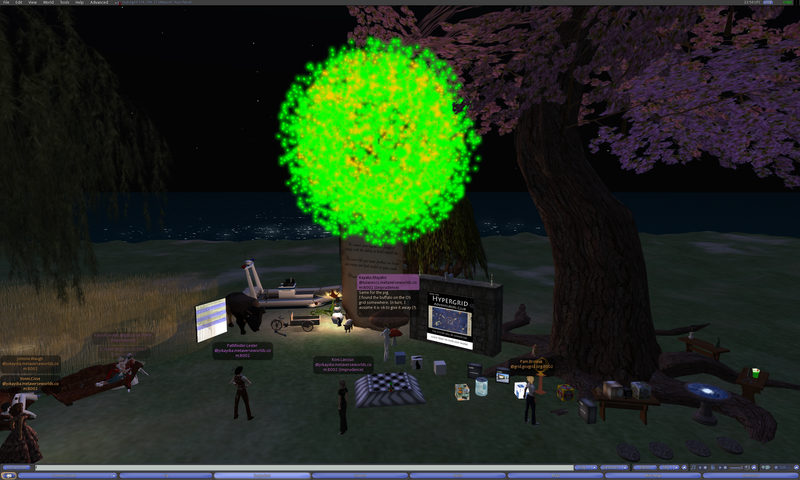 Kayako Mayako: I am building the Tulane SCS Metaverse grid in the Reaction Grid. I did not put the grid on the directory since it is under construction. Pathfinder Lester: ah, gotcha. very cool. Kayako Mayako: Also, I did not know how many folks tend to visit the different grids and each region can only support 15-25 avatars at a time. Pathfinder Lester: kayako, it depends on the region. depends on the power of the hardware running the region. Pathfinder Lester: i’ve been on opensim regions that tank at only a few avatars. and others that easily hold 50. Kayako Mayako: How many avatars can be on this region at a time? In other words, what is the max possible — given the right hardware? Pathfinder Lester: Kayako, hard to say. Intel has been fooling around with really powerful hardware and have run tests with about a thousand avs on a region. Jokay Wollongong: those 1000 avs were bots tho right? Vanish Seriath: Most of them were bots, afaik. Pathfinder Lester: Koni, good to see you again. glad you could make this meeting! Koni Lanzius: great to be here! Pathfinder Lester: cool. it’s good to see folks testing limitations like that. Vanish Seriath: Say, did we crash the sim earlier? Vanish Seriath: No, I mean the destination of the last meeting. Vanish Seriath: Forgot the grid. Pathfinder Lester: when i left StaminaGrid, it seemed fine. did it go under later? Vanish Seriath: We got disconnected around 18:00 UTC. At this point I made a quick jump to StaminaGrid to make sure it was still online. It was. Jokay Wollongong: Stamina grid was one of the first places i visited on the hypergrid..
El Sliven: I am El SLiven/Firecaster. I am Vanish’s partner and occasional poster on TGIB. Vanish Seriath: I’m V of tgib.co.uk. Vanish Seriath: We come in peace. Vanish Seriath: I like that, David. Kayako Mayako: Kay McLennan from Tulane University and the Tulane SCS Metaverse region in the Reaction Grid. My interests are building and using simulations in my online economics and business ethics courses. Also, as a way to contribute a bit of what I can to the OpenSim movement, I just opened the CONTENT collection store and started the Content Cooperative group in the Reaction Grid. Pathfinder Lester: Kayako, oh that’s YOU! Pathfinder Lester: that’s a great idea! Kayako Mayako: It is I! Pathfinder Lester: David, are you new to hypergrid jumping? Pathfinder Lester: and Koni, are you? Pathfinder Lester: that’s great. we’re all learners here. we help each other learn how it all works. Pathfinder Lester: so if you have any questions, just ask em! Koni Lanzius: I tried a couple on my own the other day and was quite impressed! 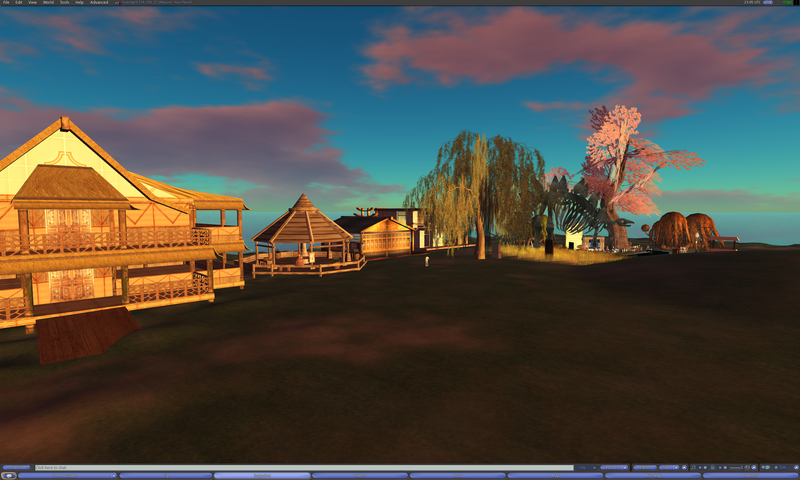 Kayako Mayako: I am new to using the right technique for hypergrid jumping — read: John’s tip to set home and relog. Prior to using this technique, my jumps were hit or miss. Pathfinder Lester: Vonni, sure thing! what’s you’re question? Koni Lanzius: my first question would be, can you port things as well as avatars? Pathfinder Lester: so if you acquire something on a different grid and put it in your inventory, it’s with you no matter which grid you are on. Koni Lanzius: thats an enourmous leap forward! Vanish Seriath: Teleport boards on what? Kayako Mayako: But I find that in order for me to port inventory back to my home grid, the items need to be full perm. That is, non transfer items disappear when I try to rezz them out of the grid they came from. Vanish Seriath: What gates do you mean, Vonni? Pathfinder Lester: so, as you can see, Vanish and El and Kayako are actually sitting here via a hypergrid connetion. Pathfinder Lester: you can tell by looking at their names. see “@gridnamehere.etc” ? Vonni Cisse: our first jump is generally to Gate 1, right? Vanish Seriath: Those boards are managed by reactiongrid, I think. Pathfinder Lester: so if someone here on jokaydiagrid registered the name “Vanish Seriath”…well, you’d be able to tell the difference between that account and the “real” Vanish from TGIB. based on the name and the “@….” bit after it. Chimera Cosmos: Was helping Spiral and almost forgot to come here. Pathfinder Lester: Vonni, I’m not sure which gates you mean. where are they located exactly? Pathfinder Lester: oooh, you mean the cone things on the platform with links? yeah, i’m not sure if they’re configured properly. 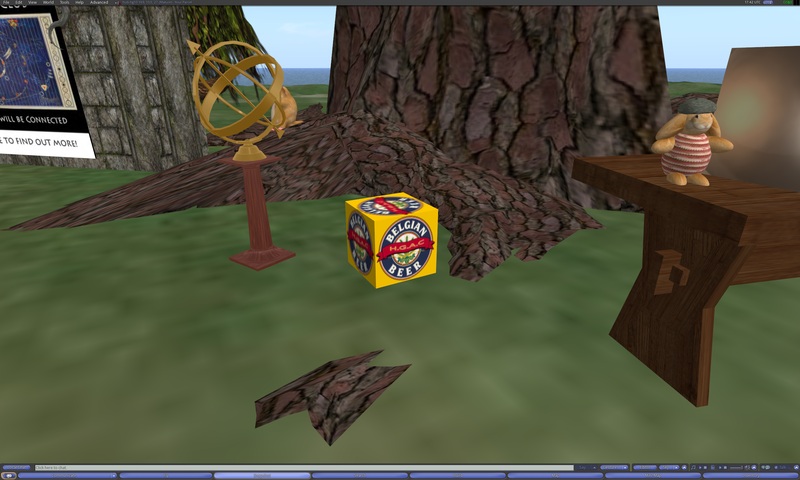 Vanish Seriath: Well, if you want to find hypergrid destinations, both http://thehypergates.com and http://hyperica.com are great resources. Pathfinder Lester: i remember trying them once, but they didn’t work exactly as they should. i’ll look into it. Vanish Seriath: Even though hypergrid 1.0 destinations are getting scarce, I’m afraid. Pathfinder Lester: Vanish, yes, that’s an issue. Vanish Seriath: Are there any plans for RG to do that? Vanish Seriath: Aw, okay. So no ETA yet? Pathfinder Lester: oh, ty Chimera! Pathfinder Lester: jokay, you and me both! Kayako Mayako: Fireworks! Thank you Liz (Kay here)! Pathfinder Lester: i’ll see if i can’t get a firm date soon. Pathfinder Lester: i’ll let everyone know when I do. Koni Lanzius: i got a copy! Chimera Cosmos: now I hope the fireworks work! Kayako Mayako: I do need fireworks — how cool! Pathfinder Lester: i set it up last night, and we already have over 60 people subscribed to it! Pam Broviak: yay – i subscribed! Pathfinder Lester: i think it will be a big help for regular members of these meetings, and new folks who are interested in learning more about what we’re doing. Vanish Seriath: Who made that fab board, btw? Pathfinder Lester: oh, the whiteboard? Vanish Seriath: Does it need media on a prim? Kayako Mayako: I agree. And now I do not know how I could have doubted — even for a minute — that the educators and others leaving SL wouldn’t stay in touch. Vanish Seriath: Wow, that’s even better. Pathfinder Lester: and it’s open source, so you can modify it however you wish. Vanish Seriath: Just grabbed one. 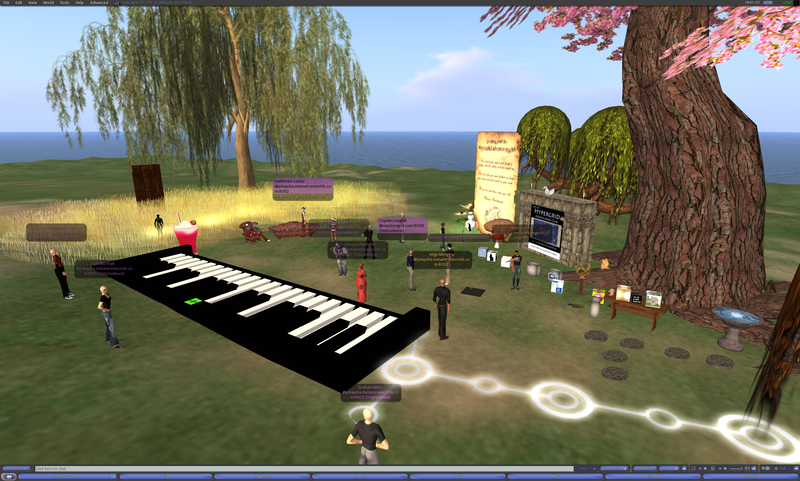 Pathfinder Lester: there’s a lot of freely available and open source content out there in opensim. the trick is *finding* it. Pathfinder Lester: Chimera, oh yes! i saw that! nice work! Vanish Seriath: Where is it, chimera? Pathfinder Lester: can you post the link here? Kayako Mayako: I saw your Comic Tutorial and thought it was terrific. What applications did you use to make it? Pam Broviak: that is awesome Chimera! 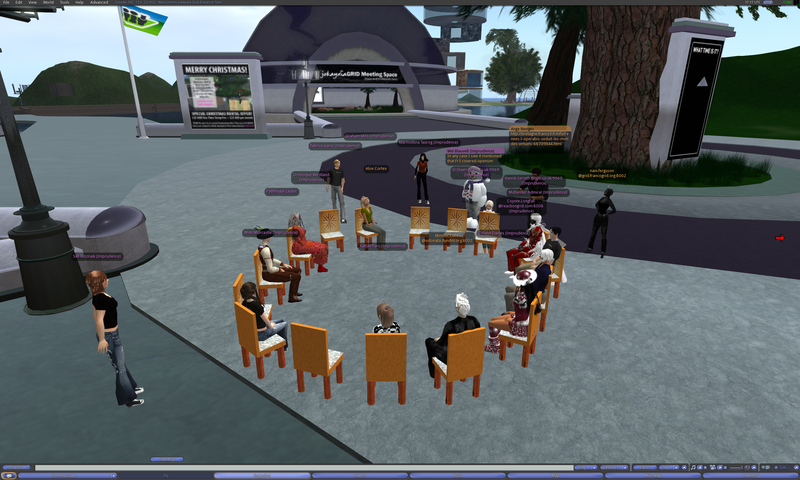 Pathfinder Lester: oh, and speaking of FrancoGrid, fabrice from francogrid was at our earlier meeting. he apologized for the trouble many folks had with trying to attend the recent opera via hypergrid. Kayako Mayako: Also, after I saw your Comic Tutorial link on Facebook I went to the Francogrid (in search of freebie skis and skates) and ran into an avatar there that keep asking me how old I was. In turn, rather than say early 50s, I kept saying I was “too old” but the avatar followed me around for a bit until he crashed and I quickly logged out. In turn, did I miss any good freebies on the Winter Sim? Pathfinder Lester: they had some unexpected issues, but they’ve learned a lot in the process. so, progress marches forward. the next opera will be in april. Kayako Mayako: Full perm too? Kayako Mayako: OK, I will have to go back. Pathfinder Lester: so you still have time! Vonni Cisse: they were not numbered so who knows, LOL? Koni Lanzius: this is all in the Franco Grid? Pathfinder Lester: Chimera, oh that’s right! Pathfinder Lester: but i found a region on a grid called StaminaGrid that was….completely empty. Pathfinder Lester: and building/rezzing is enabled. no auto-return. Pathfinder Lester: maybe they’ve forgotten about the region, or maybe they are in the process of rebuidling it. Pathfinder Lester: we can help them by leaving them things they might find useful! Pam Broviak: I’m up for that! Pathfinder Lester: and i created a sign that we have left on their region. I’ll show it to you now. Kayako Mayako: Do you know who owns it? Educators? Pathfinder Lester: there *used* to be content on it, i know that. Kayako Mayako: But the sign you created is perfect when it comes to explaining things. Pathfinder Lester: we tend to always think about finding things to acquire. it’s good to also think about giving what you have to help others. Vanish Seriath: Small announcement by us while Path hands out ncs: Next week is the first anniversary event of TGIB. Vanish Seriath: We’re holding it between the two hgac meetings at TGIB. Pathfinder Lester: oh yes, that will be fun Vanish! Pathfinder Lester: ok, let’s start! Chimera Cosmos: Oh! Doh! You are the Grid In Between guy! Chimera Cosmos: who invented the blamgate – did you Path? Pathfinder Lester: i didn’t invent anything new. i just put things together that were already out there. Pathfinder Lester: look at all this cool stuff! Pam Broviak: that buffalo is so cool! Pathfinder Lester: i’ve never seen that buffalo before. very cool. Kayako Mayako: Same for the pig. Kayako Mayako: I found the buffalo on the OS grid somewhere. In turn, I assume it is ok to give it away (?). Kayako Mayako: I have a vulture and alligator too. Pathfinder Lester: we’ve got quite a collection here from HGAC members already! 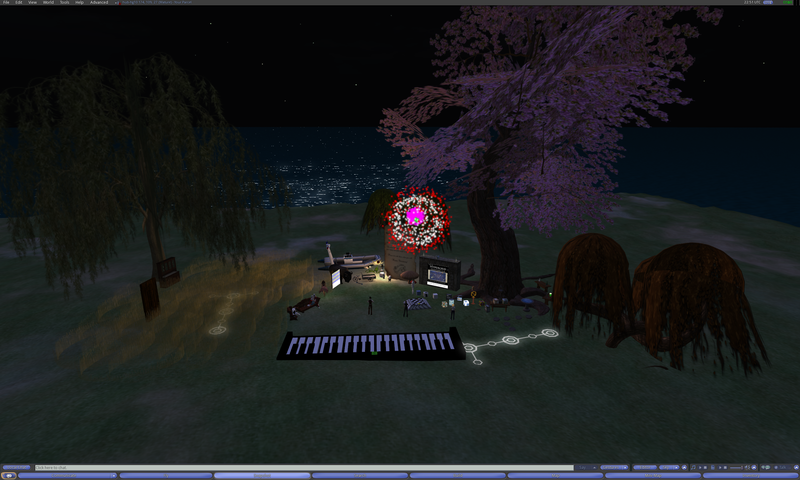 Chimera Cosmos: so this sim was empty tilll we came today? Kayako Mayako: As if the group cannot tell, I like digital animals! Pathfinder Lester: Kayako, that’s great. i love animals too. Kayako Mayako: BTW, does anyone have any full perm environmental sounds? Kayako Mayako: Thank you for the link Vanish — I will jot it down. Kayako Mayako: Wow, thank you again Johnnie! Pathfinder Lester: i have no idea if the owners of this grid will ever see this. it may be running on a forgotten server somewhere, for all we know. Kayako Mayako: I agree, still fun! Pathfinder Lester: i didn’t realize we’d all have so much to share. Pathfinder Lester: i guess that’s the power of a group! Pathfinder Lester: big dino skeleton! Koni Lanzius: i love it! Pathfinder Lester: i hope this was fun for everyone. a very different kind of tour! Koni Lanzius: thanks so much! El Sliven: Have fun on your vacation! 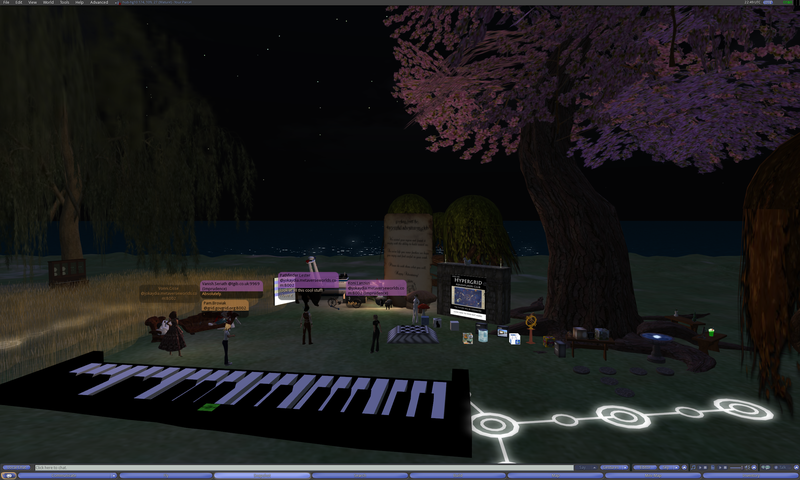 And so ends another day of exploration with the Hypergrid Adventurers Club. Until next time. This entry was posted in Announcements, Avatars, Hypergrid Adventurers Club, OpenSim, Virtual Worlds and tagged avatars, education, HyperGate, HyperGrid, Hypergrid Adventurers Club, jokaydiagrid, learning, metaverse, online communities, OpenSim, pioneers, ReactionGrid, StaminaGrid, virtual worlds by John "Pathfinder" Lester. Bookmark the permalink. What a fun trip! And lots of great info! 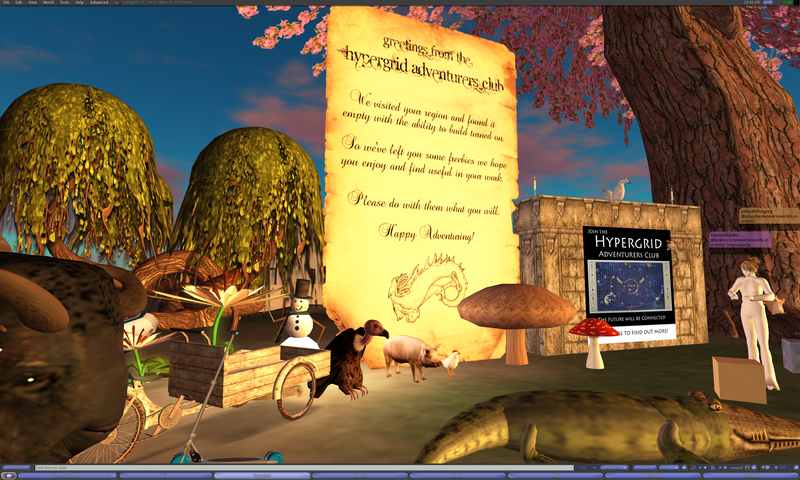 I’m looking forward to the time when our region is *finally* all finished and ready for hypergrid, because the HGAC looks a whole lot of fun and I’m really looking forward to visiting new and different places. I think having the welcome (or welcome back?) wagon is a really great idea too, but, I’d one suggestion, if it hasn’t already been made? Maybe it would be nice if people could make a selection of their favourite things, at a meeting, and have it boxed up to leave alongside the greeting message? Maybe I’m a bit too much of a neat freak. 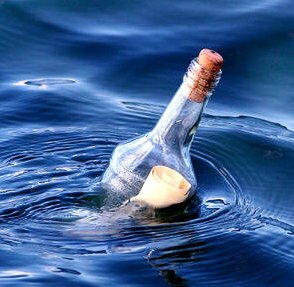 However, I can imagine someone coming back to their region and perhaps not taking it in the same spirit of generosity that it is meant in. Which would be a shame. That’s a great idea. If we do a similar “welcome wagon” excursion in the future, I’ll be sure we use your suggestion. Thanks. Looking forward to checking out your own region when it’s finished. Good luck with it! I’d also like to offer to host a boxed set of goodies on our sim with a welcome message. I think it would be really cool to offer the chance to find out more about HGAC to any random visitors, as well as share what people are making and a way to make contact with people and find new places to go and see. Heh, guess what? I was just going through my old hypergrid adress notes, and I finally found out what this destination used to be. It was once the central hub of the HyperGates network; they had a building there where you could get gates and info about hypergrid etc. I guess they must’ve moved most of it to a HG 1.5 installation, and left their old one empty.